The University of West Florida Department of Music presents the UWF Singers in concert. Featured guests, the Woodlawn Beach Middle School Choir, will perform with the UWF ensembles. The performance will take place on Tuesday, April 23 at 7:30 p.m. at First United Methodist Church, 6 E Wright Street. Dr. Peter Steenblik will conduct the ensembles as they present French composer Maurice Duruflé's “Requiem.” Written in 1947, this particular requiem derives themes from Gregorian chant, French impressionism, and Duruflé's command of the organ. The piece served as a balm to a war-torn country in need of healing. 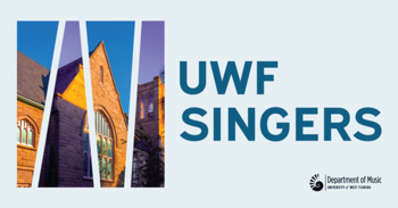 Alongside the UWF Singers are: Paul Miller, organ; Corey McKern, baritone; Joseph Miller, cello; Dr. Allanda Small-Campbell, soprano; the Woodlawn Beach Middle School Choir and the UWF Concert Choir. This event is free and open to the public. Tickets are not required. For more information or to reserve tickets, please contact the CFPA Box Office at 850.857.6285.